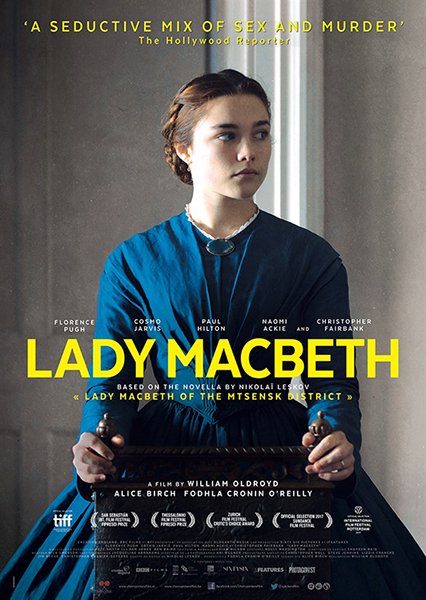 The film is loosely based on a nineteenth century novella called Lady Macbeth of Mtsensk District by Nikolai Leskov and was later adapted as an Opera. Lady Macbeth is a tragic portrait of a beautiful, determined and merciless young woman seizing her independence in a world dominated by men. A brilliantly chilling subversion of a classic. William Oldroyd’s fierce feature debut feels like Victorian noir, a twist on a genre probably invented by Shakespeare in the first place. I watched this last week and found it to be incredibly effective. Writing, direction, cinematography and performance(s) were all on point. The sound design was also impressive; creating atmospheric and naturalistic soundscapes that added to the tension. I'm keen to see anything William Oldroyd does next.